As soon as the first green shoots of potatoes, so immediately they flock striped pests and chew on the tender leaves. But it is not terrible, and the fact that they lay eggs in large numbers, and then there are the voracious yellow-orange larvae that can destroy a planting within a few days. So how to deal with Colorado potato beetle? - apparatus for spraying solutions. The fight against the Colorado potato beetle, otherwise from potato bushes will remain one of stubby stalks and harvest, of course, is no longer seen. 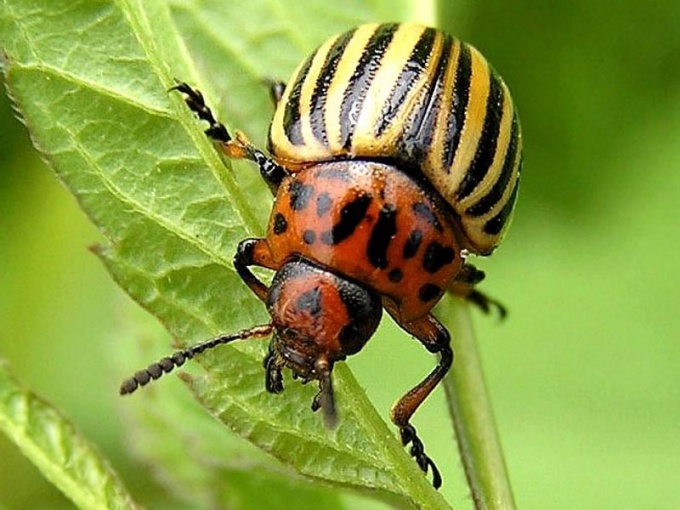 Usually destroy the striped pests by chemical means, but if you don't want to poison your crop, you can fight the Colorado potato beetle without chemicals. Pour 10 pods red pepper 9 liters of hot water, pre-cut them into several parts. Let it infused for a few hours. Then astrogate 100 g of soap in 1 liter of water and put on the stove, heat until dissolved. Connect soap and an infusion of red pepper, stir, strain and spray planting potatoes in the morning. It repels insects and they lay eggs on the leaves. Narva half a bucket of leaves of the poplars and pour 10 liters of water. Bring to the boil and simmer for 20 minutes, then remove from the heat and leave to infuse day. Spray planting potatoes, and the beetles will be afraid for them to fly up. For best repellent add more to the leaves 2 kg of finely chopped wormwood herb. It would be desirable to use chemical drugs in the fight against the Colorado potato beetle, yet they are essential when large amounts of potato. After all, why would you insist on doing 10 buckets with wormwood or red pepper. And the chemical drug is diluted quickly, very convenient and efficient. For sale is a lot of different tools. For processing potatoes need to read the attached instructions and to prepare the working solution according to it. You will need a special sprayer, but you can spray poison for beetles and a simple broom. Just be sure to tie the mouth and nose with a tissue and make sure that the poison did not get on the skin and eyes. As Colorado potato beetle eats the leaves of tomatoes for processing use better folk safe methods of combating garden pests. You can't fight the Colorado potato beetle with chemicals during flowering of potato and a month before harvest. Handle the potatoes from the Colorado potato beetle in the morning or evening as during the day, especially during hot, evaporation from the sprayed poisonous solution very harmful to the body.